A skunk struck last night. 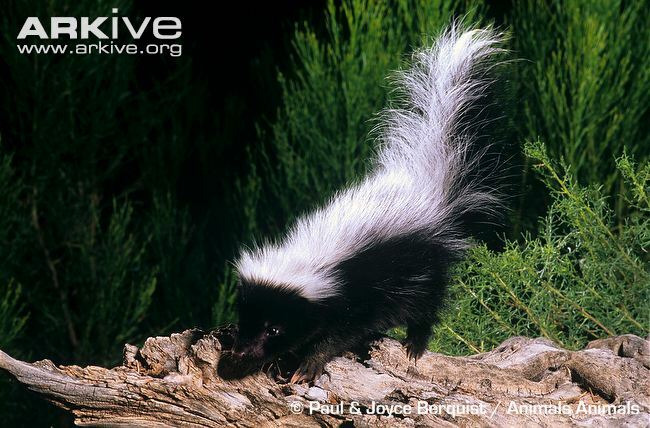 If ever there is a bad way of awakening it is to have eau de skunk waft in your window at about 3 a.m. It clears your sinuses instantly and leaves you gasping under the covers. Fortunately it was not our dog that disturbed the little fellow – this time – she learned her lesson at approximately the same hour of the night, four months earlier this year. No, some silent night hunter took the chance on this occasion. Coincidentally, our power went off at about the same time. One wonders if some poor owl didn’t fly, blind and gasping into the power line. As Greg at that time relied upon an electric clock to awake, we woke late, and the scramble began. Two minutes in the shower was followed by a mad search for his brush. Remembering that there was an emergency brush in the van – there are after all a lot of heads that usually need emergency brushing – I directed him there. He stepped out into the -20 degree winter darkness, opened the van door and leaped back in terror. “There’s a skunk in there!” he yelled. “Well it’s around here somewhere” he insisted, nervously sniffing. The skunk must have danced, tail up and spinning that night, because both vehicles smelled for days. After traveling in a stinky frozen car with frozen hair that was poking straight up, Greg arrived at work a half hour late, looking and smelling badly. He marched right past his surprised receptionist, through the waiting room and waiting patients without a sideways glance. It wasn’t his best day. In the meantime he has been very edgy around the yard, sniffing carefully before he approaches the shed, woodpile or chicken coop – all favorite haunts of a skunk, according to our children’s encyclopedia, which also said that skunks contrary to popular belief, make good pets and eat vermin such as mice, lizards and snakes – all on Dad’s current nasty list. “Isn’t it a good thing skunks don’t fly”. Ha! I love the twins’ name for it – *stunk*. I hope it slunk away permanently.